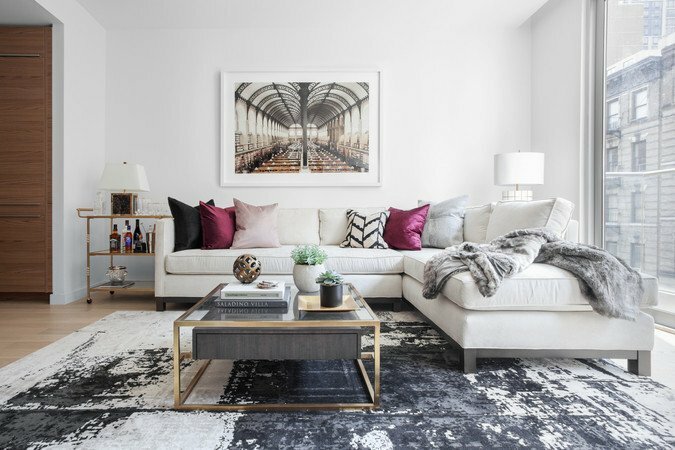 Faced with challenging low ceilings and a clinical, bland feel, Décor Aid interior designer Alfonsina R. revived this Upper East Side apartment with a spare yet focused feel that places the best of minimal design at the forefront. 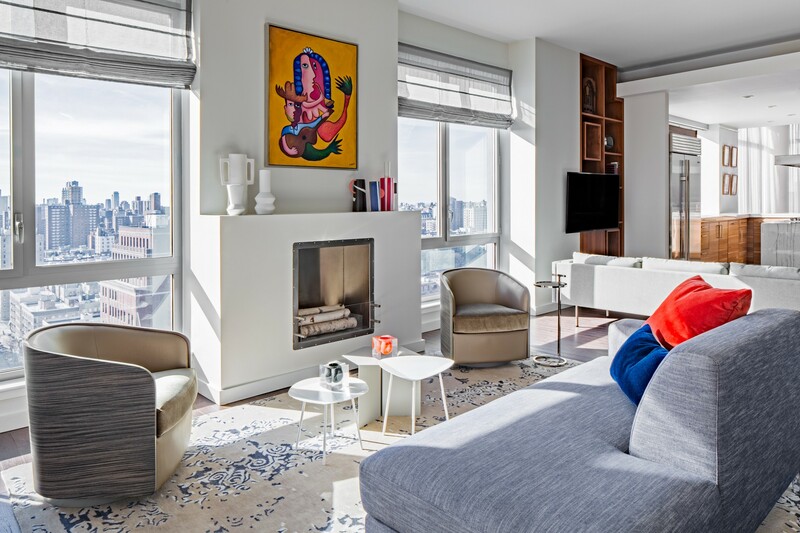 No matter the city, new urban construction may have a modern spirit, but most of the dwellings our interior designers and renovation experts come across are often short on architectural details and design elements that make them stand out. Meaning that many of our clients are often left with figuring out what to do with an uninspiring, generic white space that is in desperate need of an apartment makeover. Which is exactly the trying challenge our clients faced as they wanted their new apartment stylishly furnished while highlighting the stunning views seen from their home. Since they already had a passion for the chic simplicity of Scandinavian and Mid-Century Modern interior design and were looking to showcase their New York City-inspired art collection, Alfonsina took inspiration from Scandinavian minimalism and a soothing sense of metropolitan calm with a muted and contemporary color palette. Besides a lack of character-defining elements, the low ceiling was also a huge challenge to tackle. To address this, the ceiling was painted a high-gloss white to reflect some of the abundant natural daylight and to elevate the overall space. Another issue to address was to keep the combined kitchen, living, and dining rooms feeling as open as possible to appreciate the stunning views. To work around this, placing the television against the wall and the sofa facing it seemed like the default solution, but she did not want the sofa to be hindering any views. She went through several placement options for their television and decided to install it in the middle of the space and brought in a sleek curved, hand-polished entertainment walnut unit from Casamania & Horm, which has casters for mobility as a bonus. This way the television can easily be turned in whatever direction when needed with little effort. Save for an area rug in the master bedroom, the room was also bare so Alfonsina kept with a subtle Scandinavian spirit and brought pieces in that were light in color and feel, save for a few hits of color here and there. Signature Hunter Douglas window treatments were installed throughout to provide softness when closed and to emphasize the dramatic views when open. She worked with our client’s millworker who fabricated a sleek custom window unit to conceal the radiator and to provide storage for the media components in the living room, and installed two wine coolers in the dining area. And since almost no home can be brilliantly decorated overnight, Alfonsina and our clients deliberately left several surfaces bare so they could slowly bring in add-ons that felt well-judged rather than rushed and irrelevant.